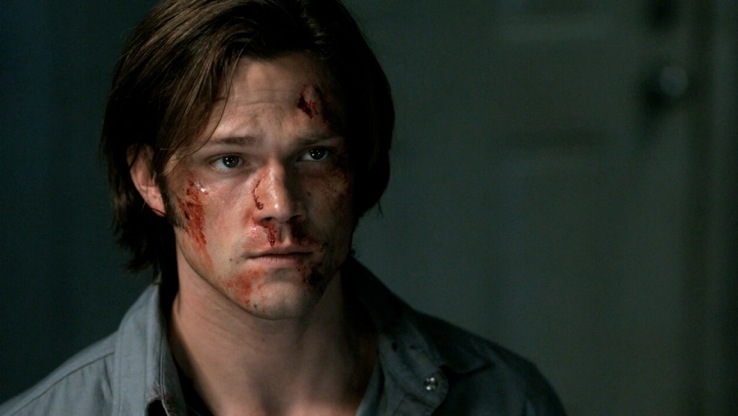 The Winchester Family Business - Recap - "Family Matters"
Itâ€™s another epic billowing in brotherly drama. This time, theyâ€™re throwing in granddad issues for fun. Plenty to cover! Then: Dean beats the holy living crap out of Sam. Brutally. Of course Sam hasnâ€™t exactly been on his best behavior but ouch. Now: Sam hazily wakes up from his savage beating. Obscured vision or not, we know that silhouette of tan trench coat. â€œYouâ€™re right, he looks terrible.â€ Castielâ€™s voice is very recognizable too. Sam moans. 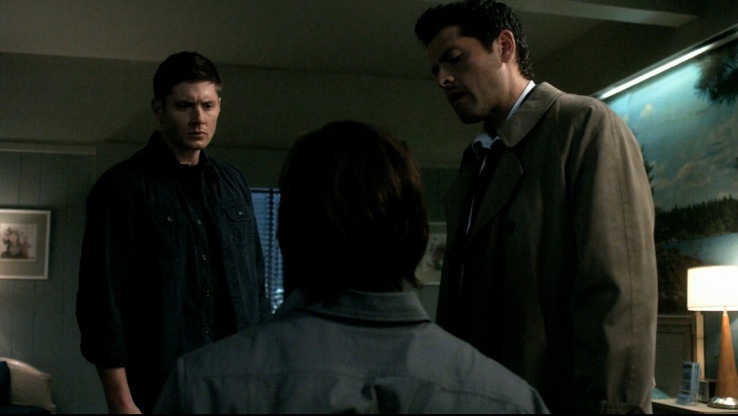 â€œYou did this?â€ Cass asks one blurry Dean whoâ€™s on the other side of the room observing. 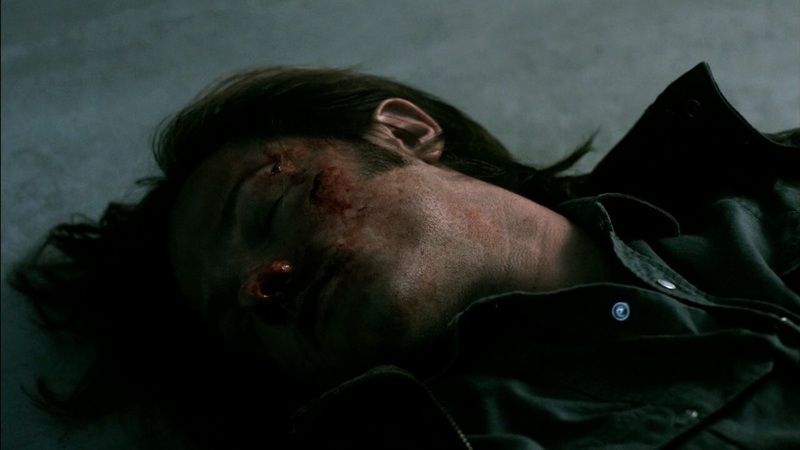 Next is a shot of Samâ€™s bloodied and battered face. Yikes! What have you done to the beauty square Dean? Samâ€™s vision gets clearer and heâ€™s getting the angelic blue-eyed stare down. 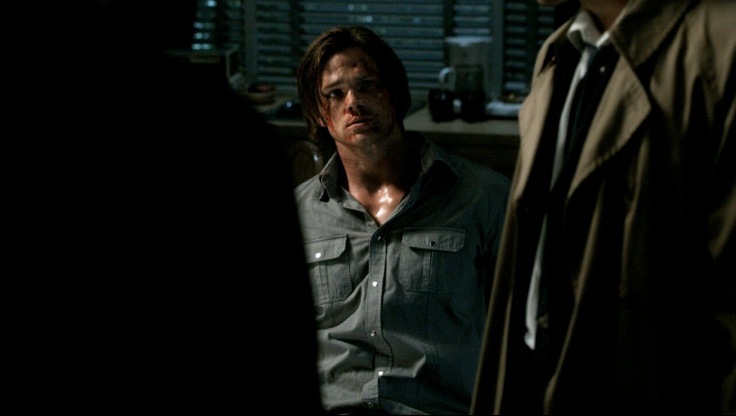 â€œCass?â€ Before Sam can ask whatâ€™s going on he realizes his hands are tied behind his back. I guess Deanâ€™s still in the â€œnot trusting Samâ€ camp. 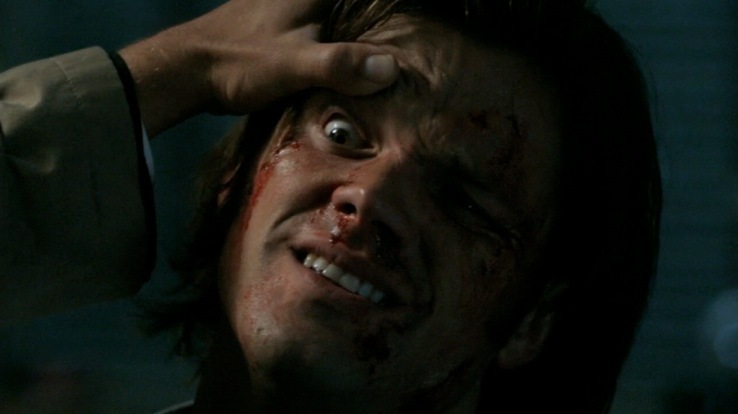 Then Castiel grabs Samâ€™s eye, prying it wide open and you know that Misha had a good ole time pulling such stuff on Jared while his hands are tied behind his back. Sweet revenge for all those other times Jaredâ€™s messed with him on the set. I wonder if thereâ€™s anything that didnâ€™t make it in the final cut. 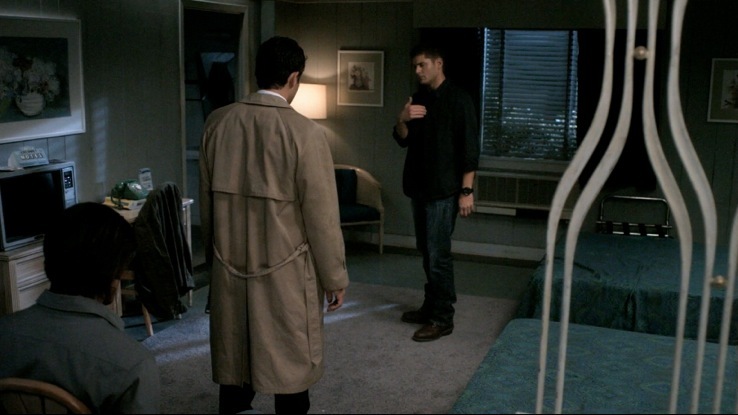 â€œHas he been feverish?â€ Castiel asks Dean as if Sam isnâ€™t in the room. â€œHave you?â€ Dean asks Sam. Yeah, heâ€™s still pissed. Nope. â€œIs he speaking in tongues?â€ Cass figures out that he doesnâ€™t need Dean for this part and repeats the question to Sam directly. No. Sam is clearly out of his haze now, for he gets it. â€œAre you diagnosing me?â€ â€œBetter hope he can,â€ Dean sharply replies. Sam tries to protest, but he is so getting the patented Dean Winchester verbal smackdown. â€œYou think thereâ€™s a clinic out there for people that just pop out of Hell wrong? He asks, you answer, and then you shut your hole, you go it?â€ Sam passively quiets down, for he knows not to mess with Dean when heâ€™s like this. Especially when tied to a chair. Castiel continues. â€œHow much do you sleep?â€ Time for shocking reveal #1 (thereâ€™s several in this episode). â€œI donâ€™t.â€ Dean is quite stunned by this. He probably didnâ€™t notice since he was sleeping. â€œAt all?â€ Dean asks. â€œNot since I got back,â€ replies Sam. Wow, no wonder Samâ€™s been hunting so much and still finding time to spend nights with hookers. Plus have shirtless workouts. Thatâ€™s got to be the nastiest case of insomnia Iâ€™ve ever heard of. Castiel and Dean share a incredulous look and Dean goes off. â€œAnd it never occurred to you that thereâ€™s something off about that?â€ Samâ€™s pretty casual about it, but then again, heâ€™s had over a year to digest this. â€œOf course it did Dean. I just never told you.â€ Good thing Castiel realizes something is seriously wrong and moves on, for then we could have gotten into Deanâ€™s rant about how you forget to tell someone that so and so called, not I HAVENâ€™T SLEPT FOR A YEAR. â€œSam, what are you feeling now?â€ Sam scoffs. â€œI feel like my nose is broken.â€ Just your nose? Iâ€™m thinking some bones on your face are really messed up too. Castiel clarifies, thatâ€™s a physical sensation. What is he actually feeling? Sam doesnâ€™t know. NOT a good answer. Castiel flashes deep a look of worry and then, takes off his belt? Okay. Sam doesnâ€™t like the look of this, thatâ€™s for sure. He suddenly gets quite uncomfortable. 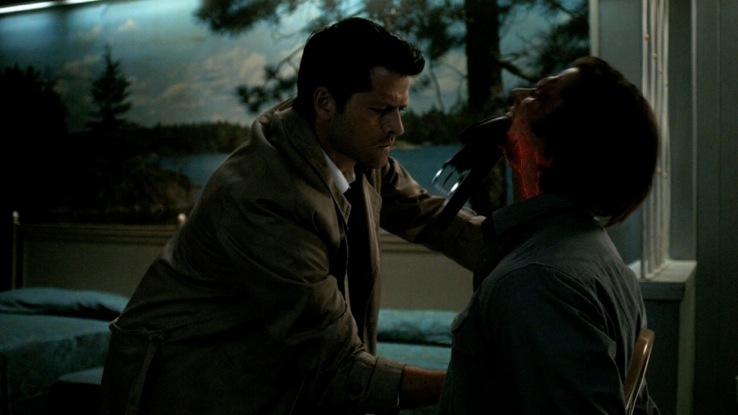 â€œThis will be unpleasant.â€ Castiel then puts the belt in Samâ€™s mouth. â€œBite down on this.â€ Oh yeah, Sam is definitely worried now. So is Dean. Castiel doesnâ€™t help the unease with his next comment. â€œIf thereâ€™s some place that you find soothing you should go there...in your mind.â€ Samâ€™s too busy looking at Castiel with fright to do that. Cass doesnâ€™t hesitate and we get one intense muffled scream from Sam. Time for the cool VFX, Castielâ€™s hand going right through Samâ€™s chest. 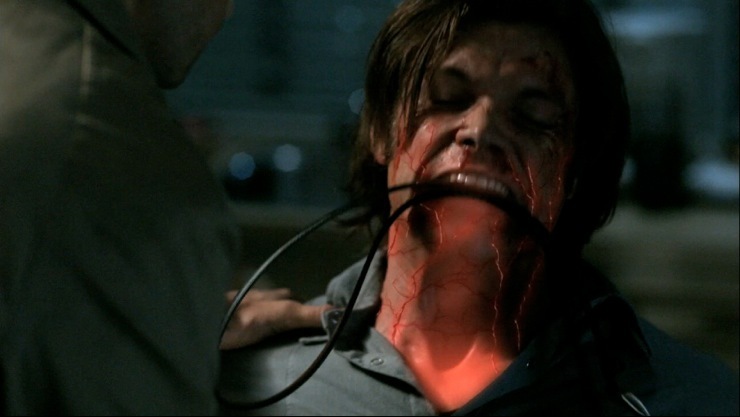 Samâ€™s neck lights up like a Christmas tree, all fiery red with veins bulging and he is in some extreme agony. This is worst Iâ€™ve ever seen him and thereâ€™s a laundry list of pain inflicted on this guy. Castiel stoically digs deeper while Dean watches in the background feeling a trite guilty now. Sam struggles a few seconds more and then Cass finishes, leaving Sam a heaping mess trying to catch his breath. 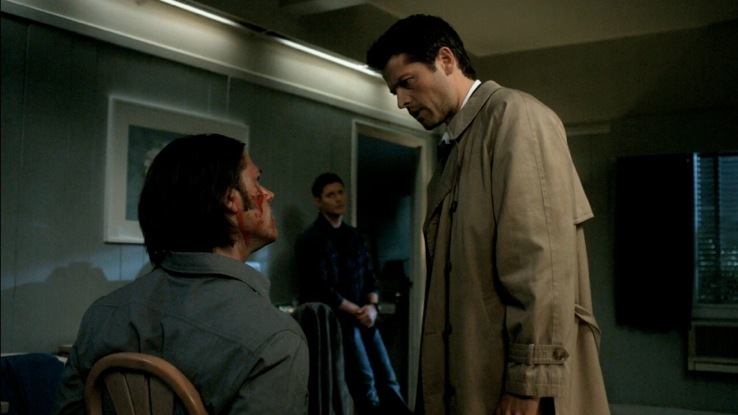 Judging by Castielâ€™s look, itâ€™s not good. Dean asks if he found anything. No, which is actually the problem. 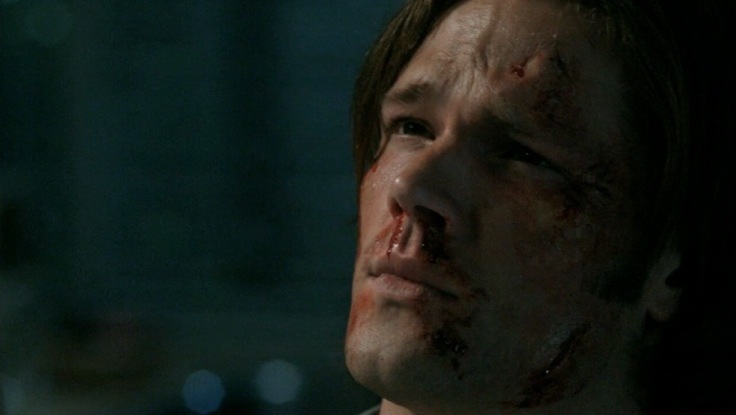 Thereâ€™s a shot of Sam who doesnâ€™t like the sound of that and man he even looks worse than before! Major kudos to the make up guys and Jared for making something that pretty look this bad. Castiel goes for the good news/bad news angle. â€œPhysically heâ€™s perfectly healthy.â€ â€œThen what?â€ Dean asks. â€œItâ€™s his soul, itâ€™s gone.â€ There we are, shocking reveal #2. Dean is stunned and then Dean and Cass look at Sam who is, well, probably wondering if theyâ€™re going to kill him now. He certainly doesnâ€™t seem very shocked, but then again, this is a soulless man. It could also be that once youâ€™ve been in Luciferâ€™s cage in Hell, nothingâ€™s shocking anymore. Shattered glass. This time with 100% less Sam soul. Dean is still trying to absorb the bombshell. â€œUm, Iâ€™m sorry. One more time. Like Iâ€™m five. What do you mean heâ€™s got no-â€ Castiel explains. When Sam was resurrected it was without his soul. So where is it? 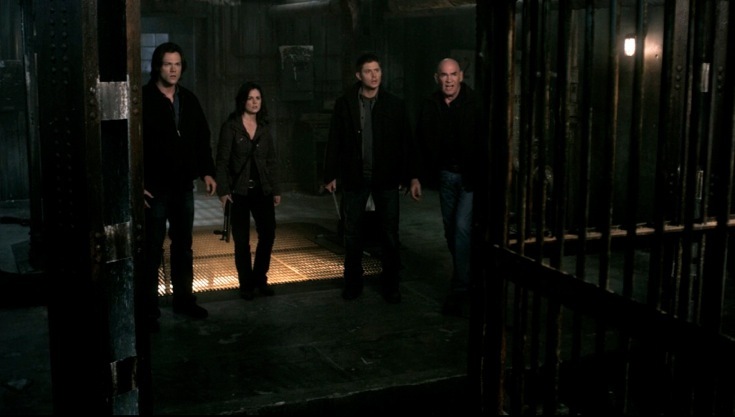 Cass surmises back in the cage with Michael and Lucifer. â€œSo is he even still Sam?â€ Dean asks. â€œYou pose an interesting philosophical question.â€ Gee, thanks for the cop out guys! I guess thatâ€™s the showâ€™s clever way of saying weâ€™ll have to find out. You got to admit, Dean probably didnâ€™t call this one. It was easier for him to have the mindset itâ€™s either his brother or not. When itâ€™s really his brother with a major piece of who he is missing, thatâ€™s a whole new ballgame. Iâ€™m sure Dean is really going to struggle with this one. Deanâ€™s got an answer, get it back. Right, do you honestly think itâ€™s that simple? Dean mentions how Cass pulled him out. Not the same thing. â€œIt took several angels to rescue you and you werenâ€™t nearly as well guarded. Samâ€™s soul is in Luciferâ€™s cage. Thereâ€™s a difference a big difference.â€ Iâ€™d say. Of course this entire time Sam is pretending to listen quietly, but heâ€™s really working on freeing himself from the ropes. For those that wonder how he could do that, heâ€™s proven time and time again how skilled he is at doing that. The only time he couldnâ€™t free himself was when he was in wimpy Garyâ€™s body in â€œSwap Meatâ€ and when Rufus took special care of keeping him down in â€œGood God Yâ€™allâ€ because Rufus knew how slippery hunters are. Awesome review! I'm lost on the souless rules as well. But then, as far as we know, this is pretty much a first. So maybe SPN feels comfortable making up their own rules. I thought the lady in the window who called to Dean and went bloody, was one of the hunters back at the Campbell compound. And Montana does the internet!!! Promise! Alice, great job as always. No matter what, Dean still cares for Sam, he wanted Cas to heal Sam right away. Have to love Dean for that. I don't know which I like more NoBS!Dean or BadAss!Cas when it comes to dealing with Gramps. As a fan of 'Smallville' since day one, I also saw the farm and thought that Sam and Dean were going to pay Clark and Co. a visit. Wouldn't that be funny. (Jason Teague may have been shot by Lionel Luther, but he was really killed by Dean Winchester). Just because Gramps is 'family', that doesn't mean that he is FAMILY. (does that make sense?) Just because he is a Campbell, that doesn't mean that Dean has to trust him, no questions asked. I agree, some episodes require multi viewings. What you may not catch the first time, or may not make sense, when you watch the episode again, then it becomes clear. I agree with your opinion of Gwen (or is it Glen Campbell? Bobby did have Kenny Rodgers on his episode). I think she is nothing like Hunter!Mary. I personally think that H!Mary would have wiped the floor and (dare I say) ceiling with Gwen. 'Sam is BFF's with a demon' DAH!!! We now know that even before Ruby, anyone that Sam considered a friend had a 99.99% chance of being a demon. Poor Sammy. Can't wait til your recap of this week's ep. The end reminded me of the end of 'Good God'. Do you agree? The heart to heart (chick flick moment) at the picnic table.